Branding Bermuda – "catch a fire"
“As a private person, I have a passion for landscape, and I have never seen one improved by a billboard. Where every prospect pleases, man is at his vilest when he erects a billboard. When I retire from Madison Avenue, I am going to start a secret society of masked vigilantes who will travel around the world on silent motor bicycles, chopping down posters at the dark of the moon. How many juries will convict us when we are caught in these acts of beneficent citizenship? —David Ogilvy, founder of the Ogilvy & Mather advertising agency, in Confessions of an Advertising Man, 1963” – An excerpt from Naomi Klein’s No Logo. There’s some questions on social media about the erection of various giant-sized corporate logos around the island, on various key landmarks. The first one I believe went up on Seon Place the other day, however most of the focus (and, I think it should be said, concern) is on Gibbs Hill Lighthouse. From the America’s Cup Twitter account. Quite a few people are pointing out the apparent hypocrisy between the Government recently clamping down on various breaches of the Advertising Regulations Act 1911 and this America’s Cup advertising campaign. So, why is the America’s Cup advertising okay? (d) sections 3 and 4 of the Alcohol Advertisement (Health Warning) Act 1993. I won’t go into detail on (c) above, however I thought it might be educational for readers to understand what the other exemptions above are. So below, to save people the trouble of going through all the various Acts themselves, are the relevant sections relating to advertising that the America’s Cup Act 2014 allows. (k) announcements, in letters not exceeding fifteen inches each in height or width, of the business name of the company, firm or person carrying on business on the premises and the general character of the business carried on therein. (c) exhibit any flashing or illuminated sign which is visible to any person on any public street or public way. (2) For the purposes of subsection (1)(a), an advertisement, the uppermost part of which is no higher than the roof line of any building on the plot on which it is situate, shall not be deemed to contravene the provisions of that paragraph. (3) For the purposes of subsection (1)(c), an “illuminated sign” means a sign used or intended to be used for the purpose of advertising the lettering or design of which is illuminated from within the components constituting the lettering or design. (a) act, or employ any other person to act, as a sandwich man or for similar purposes to walk through any public street or highway, solely or chiefly for the purposes of exhibiting advertisements; (b) in any public street or highway draw, wheel, ride or drive any vehicle used solely or chiefly for the purpose of exhibiting advertisements. (c) the space on any hoarding, or other structure used for advertising purposes, shall not exceed six feet in height. I’ll post in a separate article what those other exemptions are, as I think this post is long enough as it is. NB – Only subsection (c) of section 6 (Corporation of Hamilton) above is relevant as regards the America’s Cup Act 2014, however I felt it wouldn’t make sense without reading it in the context of the entire section. So, what do you think? Are you happy with these big advertisements going up on our landmarks? Are you looking forward to the other exemptions relating to advertising still to come? This post is essentially a public service announcement, an ‘educational’ article. Happy to hear people’s views on it all though. If anyone wants to read Ms Klein’s excellent book ‘No Logo’, this link opens to a pdf version of it. This entry was posted in Cultural Criticism, Environment, Local Politics. Bookmark the permalink. 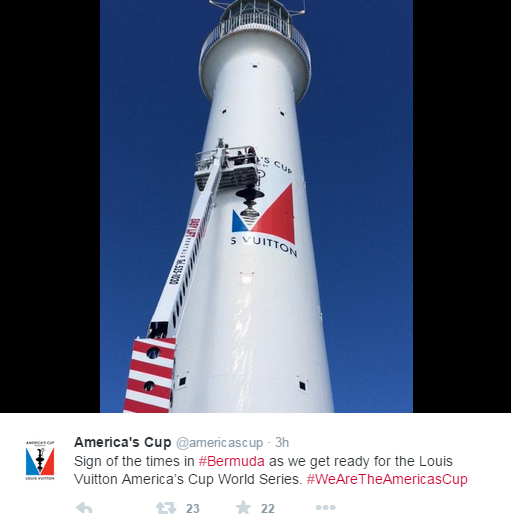 Pingback: Branding Bermuda – An Addendum | "catch a fire"